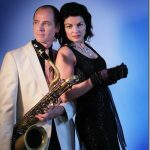 Sue Moreno and the Handsome Men bring you high class shows with repertoire ranging from easy-listening jazz to swing and famous filmsongs to classic crooners and Americana. All members are conservatory schooled and worked on many stages all over the world and collaborated with legends like Rita Reijs, Wanda Jackson, Chris Montez, Laura Fygi, Liesbeth List. Sue Moreno and the Handsome Men take you back to the golden age of music! Sue Moreno can be booked in various formations, for info on bookings, prices and possibilities, send us an email at Bookings@SueMoreno.com. It was just a matter of time before Sue Moreno and Joost Zoeteman would connect in music. Sue has always been inspired by singers like Peggy Lee, Ann-Margret and Julie London. From a young age on, she absorbed jazz standards and crooners – a style that fits her like a glove. Joost Zoeteman is a young jazz guitarist from Holland who is equally at home on gypsy jazz guitar and straight ahead archtop styles. Barney Kessel has always been a big influence on his way of playing and also in his total approach to music. Joost uncannily captures not only Barney’s style but his energy and phrasing perfectly as well. Accompanied by a stand up bass player the trio is a fact and the nostalgic, sultry and warm atmosphere of this type of music is brought back to life. Sue brings you the ultimate in classic and smooth sweet music, alternated with uptempo tunes, Latin rhythms and popsongs. A glamourous and sophisticated touch to your event. Sue Moreno will perform with recorded music.